Contestants — Shenandoah Valley Sing-In! Cantore (Latin for “singers”) is ten men who love to sing. Its members come from many walks of life—they teach, preach, program software and databases, lead non-profits, farm, write, sell things, or are retired. Their common bond is making good a cappella music. They are also active in Harrisonburg-area Mennonite churches. Their repertoire draws from a variety of styles and traditions, from standard religious choral works, international, classical, bluegrass gospel, spirituals, folk, and hymn arrangements. The group’s began as a quartet in 1999, then doubled to eight in 2001, and named itself Cantore before setting on an ideal size of ten voices. Cantore has given more than 300 performances since 2002. Our lives are full of choices. In CHoosE, we sing to remind our hearts to choose serving the Lord above ourselves. We sing to remind each other of His goodness. We sing to remind you of His love. We sing because the Lord has put breath in our lungs and a song of worship in our hearts. We sing because our God is singing over us (Zeph. 3:17). More than just an a cappella group, CHoosE is a family. Built on the radical unity of Christ, we love and serve each other with intentionality – strengthening ourselves for ministry at UVA and beyond. Good Company is a six-member a cappella group based out of the Shenandoah Valley. They began rehearsing together in the Fall of 2013 and have enjoyed singing a wide variety of music since then. Good Company released their first album, Awake, in December 2014 and their 1st Christmas album, From the Heart, in December 2016. They were honored to be crowned champions of SVCC's First Shenandoah Valley Sing Off in 2017 and are excited to participate again in 2018. 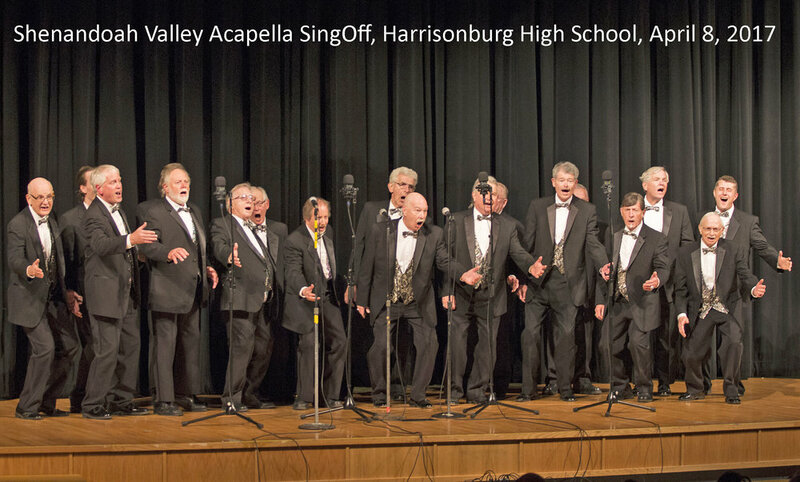 The Harrisonburg Harmonizers are a men’s barbershop chorus constituting the Harrisonburg Chapter of the Barbershop Harmony Society. We sing music in the barbershop style, a cappella, songs arranged for male voices in close four-part harmony. We meet weekly to sing songs we know, learn new songs, and enjoy warm fellowship. We perform about 15 times per year in various locations in the Shenandoah Valley. Our mission is to entertain, to educate, and to enhance musical and performance opportunities in communities in the Shenandoah Valley, all through singing barbershop harmony. We are committed to music education and to community service through music. The chapter meets 6:30 to 9:00 pm every Monday at Providence Baptist Church, 1441 Erickson Avenue, Harrisonburg. For more information, please contact Michael Calhoun at 540-842-5777. Founded in 2000, Low Key is the second co-ed a cappella group at James Madison University. Low Key was founded by a group of individuals who had both a deep friendship with one another and a love for singing. Today, the group still holds true to the foundations of friendship and music in order to entertain crowds in Harrisonburg and beyond. Shekinah is an independent female vocal ensemble based in Harrisonburg. The group originated as a student-led ensemble at Eastern Mennonite University in 2003, and in the years since has had 31 different members, released seven albums, and performed numerous concerts in the local community and beyond. Although each member has roots in the strong tradition of Mennonite singing, a variety of unique interests and cross cultural experiences contribute to the diversity of this ensemble and the music they choose to sing. Current members are Greta Bucher, Maria Clymer Kurtz, Katie Derstine, Heidi King, Chelsea Mast, Ranene Schrock Ropp, Selah Shenk and Joanna Showalter. For more information, please visit shekinahmusic.net. Vintage Mix Quartet is a “senior” quartet in the Mid-Atlantic Division of the Barbershop Harmony Society. We have been an organized and registered quartet since the summer of 2014. We sing a mixture of old and new songs arranged in the “Barbershop” style of music. The Barbershop style is generally four-part harmony a cappella singing. We are honored to be a part of the Shenandoah Valley Sing Off for the first time!